Why are there no sizes on product pages? What is a size? An approximation of what you truly measure. Created during the industrial revolution in the early 19th century, the sizing system was built to ease production flows & increase profitability. Do you still want to be an approximation? We don't want you to wear anything that doesn't size up in your life! At Hangrr, every single garment is hand-crafted only for you. To make sure it fits you perfectly there is no better way than to let go of traditional sizes and to embrace the true you in full glory. Consider it more like a luxury car - every detail hand-fixed to enhance your experience and get you all the attention you deserve. So we decided to rebuild this age-old system to something more worthy of your style & time. With Hangrr, you can choose from our variety of automated and traditional tools to create your unique size. The beauty is you need to do this only once! Haven't you ever thought how wasteful it is to wonder what size would fit you - every single time? With Hangrr you ensure you get clothes that make you feel awesome! We have also added new functionality to order a garment with alterations based on your current fixed size garments. Hence, we bring to you an amazing set of structured fits, with the minimum hassles possible. Please interact with our awesome AI - 'Lenna' during your checkout process and experience the new-age of sizing. How can I create my own unique size? 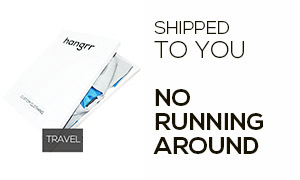 At Hangrr, our goal is to help you experience the true luxury of custom fit clothes without any of the hassles. So we went ahead and created multiple ways that you can use to create your size profile. Currently, there are 4 options to create a unique size profile for yourself. With just 4 inputs our AI, Lenna, predicts 31 body measurements accurately. It is as simple as it sounds. We check our waistlines, our chest sizes almost every few days to either count our winning gains or when we plan to shed some holiday weight. Just a quick wrap around your chest, tummy, waist & hip and you are done. It barely takes a minute. No sweat! Lenna does the remaining heavy lifting for you by handling all the complicated stuff. Fun fact: Study shows that even when the so-called experts measure you, the results vary every time even when the same person measures you twice. So relax, this is as simple as anything can get. With a tape measure and 5-10 minutes, you can enter your body measurements following our step by step guides. You can utilize this method if you already have your body measurements handy, or would anyways like to see how your body shapes up. You might require some friendly assistance while taking some of these measurements. Don't stress about the small nuances. Most of our customers share some pretty fun experiences with the whole process. Well, you know that a lot can happen over coffee - a lot more can happen over measurements! If you already fit well in fixed sizes but desire minor changes for a superior fit, we will happily get them done for you. Quickly select the changes you would like, the rest of the things would be predicted by Lenna again. She got your back! If you already have a garment that fits you perfectly, you can just send us the same. We will replicate and save the fit for you. Why reinvent the wheel, right? If you need any assistance with sizing please feel free to get in touch with your assigned Hangrr stylist. He/ she will be most happy to guide you through the process. You can even talk to our support stylist live. Enjoy the new-age luxury! What difference does it make if I use predictive measurements vs fixed size tweaks? The answer really depends on your body & body type. If you fit the ideal chiseled male model body frame, by all means, base your sizing over a fixed size. But if you are not lucky/motivated to maintain a perfect body, you can go ahead with our predictive measurement tool. It is very simple and is only your mental obstacle that it would be time-consuming. Follow our simple guides outlined in your Hangrr user account for a seamless 2 minute way to measure your self. It's that simple. But if you are confident that you fit great into fixed sizes - that's great too. In that case, you do not need to measure yourself. Just add your best size and customize the details that you will like. You can also choose to change small details in your sizing while you do so. Simple! What do I need to take my measurements? All you need is a measuring tape, and we guarantee a jolly good time. 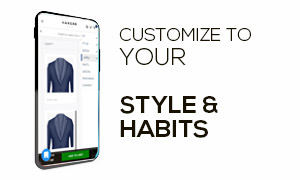 You either need to login to your Hangrr account to enter your measurements or you will be guided through the checkout process to create your unique sizing profile automatically. The measurements you take must be in inches. If you have your measurements in cms, please forward them to our stylists either online or via email (stylist@hangrr.com). They will convert them and upload them directly to your account. Do I need to go to a tailor? No, you don't need to. It is extremely easy to get your measurements right by yourself. If you still feel you need to see your tailor, please contact us for a tailor help guide and please ask him/her to follow it carefully. Who can help me with my full-body measuremnts? Absolutely anyone. The whole purpose is to ensure you look awesome when you receive your Hangrr clothing. He/ she could be your friend, a family member, a neighbour, your spouse - anybody who could spare 10 minutes of their time for you. When can I get my measurements done? That's the best part. Anytime you like from the comfort of your home! No wait times, no commute - just plain simple! What if I am not sure if I can measure myself? Well, we can understand. Write to us and we will find a solution for you and will be happy to assist you in anyway possible. We are always there for you, just drop an email at care@hangrr.com or talk to one of our stylists online. Can I upload my measurements in Centimeters? We would like the measurements to be in inches. That helps us ensure the best possible procedures and avoids any confusions or errors in the process. If you still insist we will manage the conversions at our end. If you have your measurements in cms, please forward them to our stylists either online or via email (stylist@hangrr.com). They will convert them and upload them directly to your account. Where do I get a tape measure from? If you don't already have one, these are freely available locally at any stationary shop for a very minimal charge. Incase you have difficulty finding one let us know on care@hangrr.com or talk to our live stylists online. Our style of producing the best fits is very unique and currently you cannot base your measurements on a well fit suit that you have. You can visit us at our stores or pop-up shops when we are in your city. You can choose to send us your garment and we will decode the garment for you. We trust your inputs while making custom garments for you. So please take a little care while entering this information. All our remakes & alteration policies are governed by a fair usage policy. According to this policy we will not be able to accept remake / alteration claims if the error in judgement / entry is more than 4 inches. For instance, if you wear a size 38 and you enter 42, there is only so much we can do. Or if your chest measurement is 42 and you enter 32. So we request you to please double check your sizing information for helping us give you the best clothes you will ever wear. We are forever thankful for your coorperation and pledge our full support in the conquest of making you look dapper.